We survived Prom! And my son had a great time too! Of course, he’s used to having a camera in his face…and he did not disappoint! Of my 2 boys, this one, JJ, is my comedian, my clown, and just plain old silly to be around, can you tell? For this layout, I used a film strip to show off several of the outtakes from the gazillion photos I took. I used the E-Z Dots® Permanent Refill to adhere the little pictures to the back side, without having to worry about adhesive showing through. 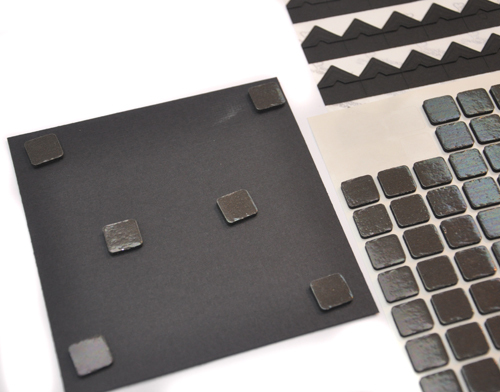 E-Z Dots® Permanent are clear and perfect for intricate die cuts! You’ll notice that I placed the refill for E-Z Dots Permanent inside the shell for the E-Z Runner® Refillable, and can switch out the refills at any time, without having to use up an entire runner! And you can see through to see exactly which refill is inside the shell! I’m not a fan of skewed photos, but I felt like this layout could use some angles, especially with the linear paper…which is from a fairly feminine line, Pink Paislee’s Hope Chest. I used my trimmer to make line up the photos to be sure they were actually straight. I tucked some Pink Paislee die cuts and and journaling cards around the photos to break up the lines. Those were inked along the edges with brown ink. This entry was posted in 3D Foam Squares, Adhesives, Crafts & Tutorials, Creative Photo Corners, E-Z Runner® Dispensers, Permanent Adhesive, Scrapbook Page, Scrapbooking, Seasonal Craft Ideas, Spring, Tutorial and tagged 3D Foam Squares Mix Black, 3D Foam Squares Regular Black, Beth Pingry, Clearsnap, Creative Photo Corners Black, E-Z Dots Permanent, E-Z Dots Permanent Refillable, Hobby Lobby, Pink Paislee, Prom, Recollections, Scrapbook Page, Sizzix, Thin 3D Foam Squares Black, Tsukineko, Tutorial, Websters Pages. Bookmark the permalink. 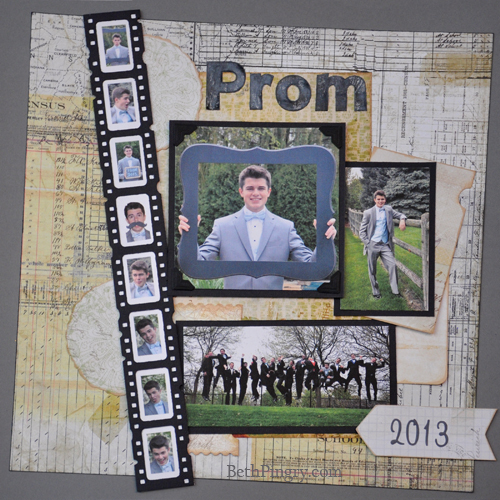 3 Responses to "Prom 2013 Scrapbook Page Tutorial"
Great layout, Beth! Lovin’ all the pictures – he’s a good model! LOL! Great tips on each of the product…love the refill idea of interchanging with ease! I spy photo corners – looks great as an accent to the pic 🙂 Again, congrats to JJ!! This is an awesome Grad layout! 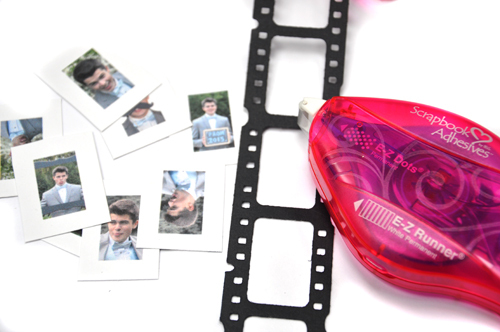 I especially love how you made that film strip of thumbnail photos! Love the filmstrip! Love the layout! Your model–well he is pretty darn awesome!